qualitative analysis to identify the impact of agile project management on the efficiency of virtual classroom project. In this paper, we will address the role of the project manager from different perspectives and provide training to the project team on the agile methods will mitigate the risk levels in the project. The paper is concluding the need to engage with the academic strategy in order to increase the institutional performance of learning outcome. Agile project management methods have been initiated from industrial practice to ensure a higher rate of success in software development project. The processes of agile methods allow the project scope to change rapidly by placing emphasis on the stakeholder involvement and communication. Using this method in learning at education sectors became essential and imperative to improve teaching effectiveness and lead to better academic performance in higher education institutes. Virtual Classroom (VCR) is one example of online e-learning system which is unlike traditional classroom wherever the user and his/her computer happen to be, VCR can be created in supported environment of real class which includes all the course materials. - Satisfying the customer through early and continuous delivery of the software. - Welcome changing in the requirements, even late in development. - Delivering the software from couple of weeks to a couple of months preferring to the shorter time. - Developers and business people should work daily within the project. - Building the project within proper environment by supportive management to get the tasks done. - The most efficient method to convene the information is face-to-face conversation. - The primary measure of the progress is working software. - Continuous focusing on the good design enhancing the agility. - Simplicity in the work. - The best requirements, architecture, and designs emerge from self-organizing team. - The team should become more effective during the work on the project. We will discuss implementation of agile project management method in virtual classroom and how we can mitigate the complexity of the project. To understand the success of agile method in implementing virtual classroom project, it is very significant to understand the processes through right framework base on previous literature. Our study is how to use agile methods in implementing virtual classroom project; we will address the efficiency of virtual classroom while using agile methods in implementing the project from different prospective. We will identify the effect of the project manager role in using the agile methods and addressing the effect of the training to the project team on mitigating the risk levels in the project. In (Figure 1), we conducted some of the research study to find the gab of project efficiency in implementing virtual classroom project. We will put potentials to address the effect of agile method on the role of the project manager, and providing training to the project team in agile methods will affect the level of the risk in the project management. In this study, we will put some of the potential application in using agile methods. H1: Agile methods will affect the role and performance of project managers. H4: Robust applications that are easily maintained are developed. The agile software development process has continually gained applause among software developers. This is highly attributed to the advantages that the process offers as compared to other development methodologies (Chin, 2004). As a result, the need to better manage the process has with time evolved into agile project management. Therefore, from an overview approach point, agile project management is a branch of agile methodology. The raise of this type of management process can be attributed to the lack of the traditional methods to provide a suitable empirical, non-repeatable and unpredictable management process approach (Agilemethodology.org, 2008). The failure did not augur well with the development methodology of the famous agile method. From definition, the agile process is open to change. This is from the simple fact that unlike the waterfall development methodology, this process realizes that projects are open and prone to change and can never be sequential. A good example is the development of a virtual classroom where the needs of students and teachers are constantly changing. The process aims at ensuring that developers and the project stakeholders embrace change and incorporate it in the development of the project to ensure that the final results meet the needs of all the stakeholders involved. Change can occur in a variety of fields from schedules, budgets and the environment both internal and external environment (Cervone, 2011). The occurrences of these changes leads to the need of proper project management to ensure that all the changes are incorporated. Agile project management provides a solution to the changing nature of the project to ensure a streamlined approach of the needs of the business and the external stakeholders. To achieve the needs and objectives of the business, the agile project management is composed of certain values and attributes. Among this, the key concepts are the customer, feature and done attributes. The decision and the metrics of the management process in the agile approach revolve around these concepts. Understanding the customer, the feature and the timeline within which the feature is accomplished enables a deeper understanding of the process. Customer- this is the end-user for whom the software is being developed.in the case of a virtual classroom, the end-user is the student. The customer is responsible for the initiation of the development process as they define what and when the software is to be delivered (Cervone, 2011). Therefore, the development of a virtual classroom should be seen from the eyes of the student, what they expect to be accomplished by the software and whether it will give them the look and feel of an actual class. The development team, led by the project development manager must comply with the needs of the students to ensure a smooth development and management process for the end-product. To align the requirements and the objectives, the agile project management process enhances the duties of the customer to comprise of making decisions and answering project domain questions as well as prioritizing what should be delivered and when (Wysocki, 2009). Therefore, in these scenario, students acts as the point of contact for providing the directions on the project. The agile project management process proves to be more powerful as it can incorporate more than one student. Therefore, justifiable to be adopted in a learning institution. Feature- a feature defines how a system behaves. In the case of a virtual classroom, it defines how the stakeholders involved such as students and teachers interact with one another. The student is not only the end user as the teachers and system administrators are also involved in viewing the information and tracking performance. The success of a project has to comply with the feature specification of all end users. The features defined by the student must be verifiable in terms of design specifications as well as the functionality. If student needs are not met fully by the resulting virtual class application, the probability of lack of satisfaction will be high and this may lead to a redo of the system (Karlesky, V & er Voord, 2008). This means that the project management failed since there lacked a proper coordination between the end users and the developers. The agile project management process was designed to ensure that the features of a project are fully documented and implemented for the sake of meeting the needs of all the stakeholders involved in the process are satisfied. A proper definition of the feature is necessary to ensure that the features are not confused with tasks or modules (Wysocki, 2009). In large projects, it is a common occurrence to divide the system into modules. If the features to be delivered by the system are not fully documented, the module developers may forfeit their roles and fail to deliver the complete functionality of the system and blame the collaborating developers. With the agile project management approach, the feature must be explicit in order to show who is to deliver what and when. Features are not possessive of the details of implementation. However, they pay attention to the functionality and the requirements of the users. In a virtual class for example, the following modules are to be implemented; the teachers module, the student module and the administrators module. Done- done defines the point at which all the features of the project have been fully delivered and implemented. On a single analysis basis, this sounds like a simple task and one that is straight forward. However, determining when all the predefined features are met can be hectic especially when the initial feature were not fully documented. A point of contradiction has always been observed arising from the traditional management process as they lack a well-defined and elaborated approach to the project feature and customer requirements. Using Gantt charts, project timelines can be met with all the stages being well implemented within a specific periods of time. The agile project management process guarantees up to 95% completeness of the project within the specified period of time (Karlesky, V & er Voord, 2008). This is a success as compared to the other management processes which are not time specific and fail to capture customer needs. Having a well-defined ‘done’ approach is essential in determining when the project features have been met. This is what the agile project management achieves. A state of completion has to be met for the feature to be termed as done. Various tests such the system, unit, user acceptance and functionality tests have to be met by the system for the done concept to be full realized (iTnews, 2014). Failure to this, the system does not meet the full scope of the done module. The developers have to test the system for proper auditing and performance and provide the customer with the module to cross check user acceptance (Karlesky, V & er Voord, 2008). A virtual classroom will be termed complete only when all the modules previously mentioned are fully implemented and asserted to be functioning properly. 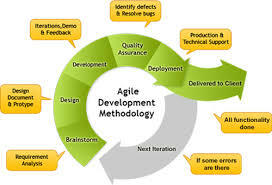 The agile development project has a variety of advantages. However, this merits cannot be fully realized if the development methodology that was used in initial development of the process utilized the traditional methods of software development life cycle. The change from a traditional approach to the agile approach requires a change in the way the development process is carried out. Changes such as in the user requirement analysis, design, project scheduling and team management as well as the measuring of the project progress must be reviewed (iTnews, 2014). This means that the project management using agile method is not suitable to be implemented in all organizations. The goals, mission, aim and the process flow of the works and processes within an institution must be reviewed for the project to be implemented and managed using the agile approach. A school has to specify its goals and objectives prior to adopting this method. It is paramount to note that a model that works for one institution of learning may not necessary work for the other due to differences in the courses and schedules offered. In the same manner, an agile management approach that works for a certain level such as high school may not be adopted for a college or a university. Another key challenge that arises in this process is finding a reliable, well acquitted and understanding project manager with skills, experience and ability to provide management and coordination of the stakeholders of the project. Creation of virtual classes will involve teachers and students that are not familiar with the jargon of programming. Therefore, the project manager must provide a balance between external processes in the project development and internal processes and interpret user requirements effectively. To achieve this with effectiveness, the project manager must be well acquitted with the agile development method (Goncalves & Heda, 2010). This challenge arises since experienced managers are hard to acquire and when they are acquired they tend to be expensive. This provides a negative effect on the cost, scope and time expected to deliver the project. The customer may hasten their project delivery times to ensure that the costs are kept to a minimum. Consequently, some features of the project may not be fully implemented. In the maintenance process, the agile project development approach cannot be fully applied to systems that did not adopt the development approach of agility. The agile development process is prone to a number of misconceptions that people attribute with the process. Despite this, the misconceptions do not reduce the productivity or the power of the process. Some of the major misconceptions that are held concerning the approach are outlined below. ü People assume that the practitioners of this approach do not plan. However, this is a misguided misconception as a lot of detail has to be laid down in the planning phase. ü Requirements definition and analysis are seen as being disregarded using this approach and most people, especially customers assume that their contributions to the process is being disregarded. However, unlike the other processes, the approach takes into account the contribution of the end users in all the phases of the development. Therefore, the requirement definition and analysis may not be seen in the initial phase as evidenced using the traditional approaches but can be evidenced in all the changes that are incorporated in the development of the software. The success of implementing the agile process lies in the ability to manage and maintain a project portfolio. A good project portfolio outlines the aims of a process and the suitable projects that the methodology can be implemented. The agile approach is suitable for experimental and innovative projects such as a virtual classroom. Therefore, for emergent projects whose requirements are not fully grasped in the initial phase, this process can be used as the requirements will be realized during the iterations phase and when the first few prototypes are delivered to the customer (Christiansen, Turkina & Williams, 2013). Using this method, the initial prototype will be redefined to meet the needs of the customer as their needs evolve based on the functionality offered.